In October 2015, the Philippines filed a pending arbitration case against China through the Permanent Court of Arbitration in the Hague, arguing that the Chinese regime’s claims to the South China Sea violate international law. As a decision on the South China Sea looms in international court, the Chinese regime has done all it can to avoid the case—from stating it will not participate, to making threats against the Philippines, to rallying African nations so as to claim a base of support. Yet with the ruling now just around the corner, the Chinese regime is pulling one last card out of its sleeve. As Mark Eadas writes on Foreign Policy Association, Chinese state media and the South China Morning Post (which has been brought more deeply under Party control), announced a new “legal challenge” and “fresh uncertainty” on the case, submitted by a legal organization called the Asia-Pacific Institute of International Law (APIIL) in Hong Kong. 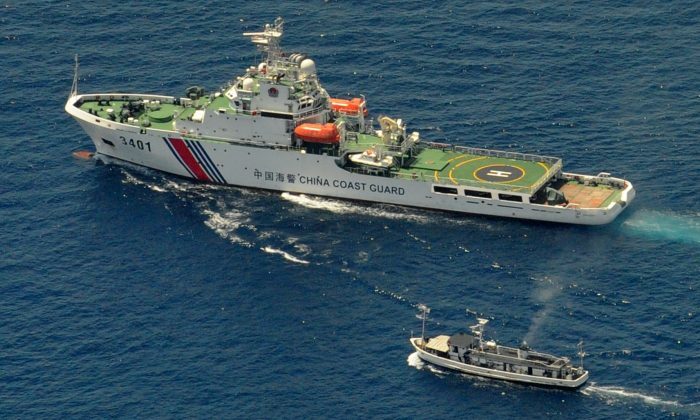 The APIIL submitted a “friend of the court” brief that avoids the issue of whether the Chinese regime has legal rights throughout the South China Sea, and instead claims the court itself lacks jurisdiction for a ruling. Eadas notes the brief hasn’t yet been made public, so its full details aren’t clear. The claim itself may be interesting for anyone watching the South China Sea dispute, given that it suggests the Chinese Communist Party (CCP) doesn’t seem to believe its claims of “historical sovereignty” will hold up. But what’s really interesting about the new development isn’t the claims themselves, but instead what’s really behind the organizations making the claims. But as Eadas notes, Fung’s allegiances already lie elsewhere. He has a long track record of supporting the CCP’s stances going back to at least 1997; and Chinese state media also missed the crucial detail that Fung is a delegate of the CCP’s Chinese People’s Political Consultative Conference (CPPCC) in Beijing. In 2010 he was found guilty in Hong Kong for professional misconduct. The report also notes that the CPPCC is directly operated by the CCP’s United Front Department, which is one of the Chinese regime’s main spy organizations and focuses specifically on infiltrating power structures abroad to expand the CCP’s control of foreign politics, business, and public thought. Epoch Times has deeply exposed the United Front Department over the years, along with its sister spy department, the Overseas Chinese Affairs Office. And the strings that pull Fung don’t end there. Eadas writes that Fung is also a founding governor of the China-United States Exchange Foundation (CUSEF), which poses as a non-political and non-governmental organization. Yet, Eadas cites former deputy assistant to the vice-president of the United States for national security affairs Aaron Friedberg stating that it has ties to the CCP and to the Chinese military. And the case also shows a level of fear and doubt among the Chinese regime’s leaders, facing a pending case that will officially expose the falsehood of their claims to the South China Sea and give international backing to nations that oppose them.